The ever-expanding culinary industries need a dedicated and skilled workforce. From fine dining to catered events and even the growing popularity of food trucks, UH Maui College’s Culinary Arts Program prepares students for the stimulating culinary field. Our graduates have attained positions at 5-star resorts and restaurants, opened independent businesses, and starred in top cooking shows. Now, Chef Travis savors those details on a daily basis at Three’s Bar & Grill, Three’s Catering and Fork & Salad. He also helps provide opportunities for the up-and-coming chefs from UHMC to gain credit hours and tangible experience by being part of their catering teams. The standout students can even land jobs at the restaurants once they finish the culinary program. As Chef Travis describes in our video, the restaurants support the school any way they can. And one huge way is through Noble Chef, UHMC’s largest fundraiser, known as “a premier hospitality event celebrating culinary arts education on Maui.” Travis will be there as one of 12 featured chefs at The Fairmont Kea Lani in Wailea on Saturday, October 28. So what’s on his menu? Come experience the delectable delights for yourself at the 21st annual Noble Chef, and give Maui’s top-notch culinary program the support it deserves!! Our catering operation began as the backbone of our business! It helps to not only support, but also strengthen our success to this day. So we wanted to share five things you’re likely to notice when Three’s Catering is on the scene! Like you’ll find on our breakfast, lunch, dinner and happy hour menus at Three’s Bar & Grill, our diverse catering options are packed full of top-notch ingredients! We go local whenever possible with our proteins and produce, and take pride in all we have to offer our catering clients, from freshly-picked Kumu Farms field greens to locally-caught Ahi tuna to grass-fed Hawaiian beef! Our well-trained team knows how to work together with precision, positivity and professionalism. We’re a full-service catering company, meaning we have event-planning expertise that can innovate and coordinate, from the seed of an idea to day-of festivities in full bloom. Customer service is a priority, and we know how to connect and collaborate with other vendors and partners to make every event a success! In the mood for sushi? Want to feature a whole roasted pig station? Need to feed hundreds on a budget? Three’s Catering can customize our services to meet your needs, no matter if you’re hosting an intimate family gathering, casual business luncheon or lavish wedding. We can even arrange for our food truck to roll up on your event! Well, not all the time…but you may get a glimpse when you climb aboard a Pacific Whale Foundation boat! Snorkel fun, Island Rhythms reggae cruise, sunset dinner trip, you name it. All the food you enjoy comes from us, and we have a team dedicated to crafting those delicious eats on a daily basis! If it’s not humpback whale season, you’ll at least savor a high-seas adventure, epic food and maybe a stunning sunset! We build long-lasting relationships with our clients and strive for success, so oftentimes we cater events more than once, or even on a regular basis. For instance, the Maui Arts and Cultural Center was our very first client, and we continue to partner with the MACC at ongoing shows and concerts where you’re likely to see Three’s food truck; the health and wellness session with Oprah Winfrey in June; and Maui Calls dining and wine event, which celebrates plantation days on Friday, August 18 this year. There are oh-so-many other reasons we’re stoked on Three’s Catering, but this list gives you a glimpse of why we’re so proud of our team, and grateful for our clients, vendor partners and community support! Three’s Pūpūs are Named “The Best” on Maui. Here’s Why! 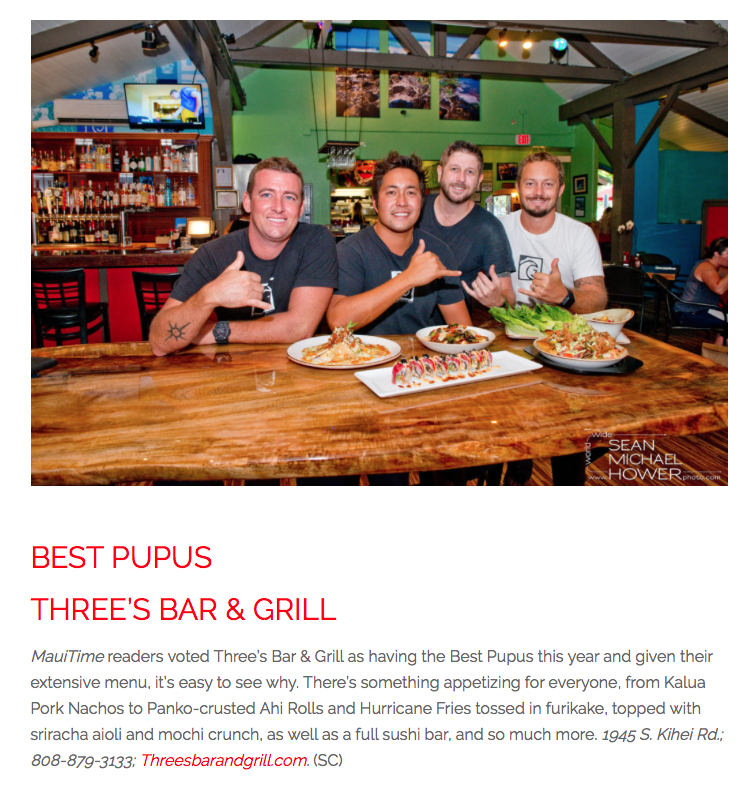 Three’s Bar & Grill wins Best Pūpūs for 2017 from MauiTime! Photo courtesy of MauiTime. Going out for pūpūs, Hawai‘i’s word for appetizers or tapas, is a longstanding tradition in our state. We’ve crafted our diverse pūpū menu to appeal to everyone. 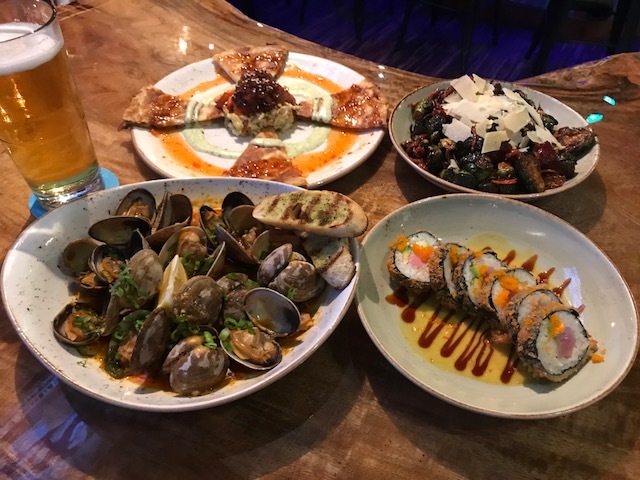 It’s value-driven, fun and chef-inspired; with everything from wings and quesadillas to fresh-shucked oysters and sushi! We offer great deals on them during Three’s double happy hours, between 3 and 6 p.m. and again from 9 to 10 p.m., seven days a week!! Kalua Pork Quesadilla, a longtime favorite on Three’s pūpūs menu. It’s an original — our very first menu item, in fact! The BBQ Kalua Pork Quesadilla features spiced Maui Gold pineapple and mango chutney, cilantro aioli and peanut ginger slaw. We rolled out this item at a wedding expo back in 2008, when we had just started our catering company. It’s near and dear to our hearts and is a real crowd pleaser. It’s sweet, smoky, and of course, CHEESY!! Bacon-fried Brussel Sprouts, available at Three’s and featured on Food Network’s Diners, Drive-ins and Dives! Another must-try appetizer is our Bacon-fried Brussel Sprouts. Seriously, give ’em a shot! Brussel sprouts are a hot item on the trendy foodie scene, so we wanted to reinvent our own version. 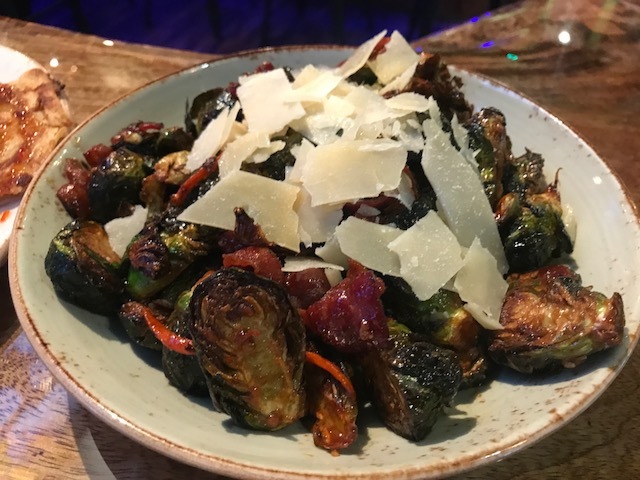 These brussels are wok-fried with bacon, garlic, ginger and carrots, then glazed with kimchee-balsamic and garnished with shaved Parmesan. They’re SO addicting, you may even catch a glimpse of them on our Diners, Drive-Ins and Dives episode this Friday, July 21 at 6 p.m.!! Panko-crusted Ahi Roll, among the top appetizers at Three’s Bar & Grill. We’re known for our epic sushi at happy hour, but one item that definitely defines us is our Panko-crusted Ahi Roll. 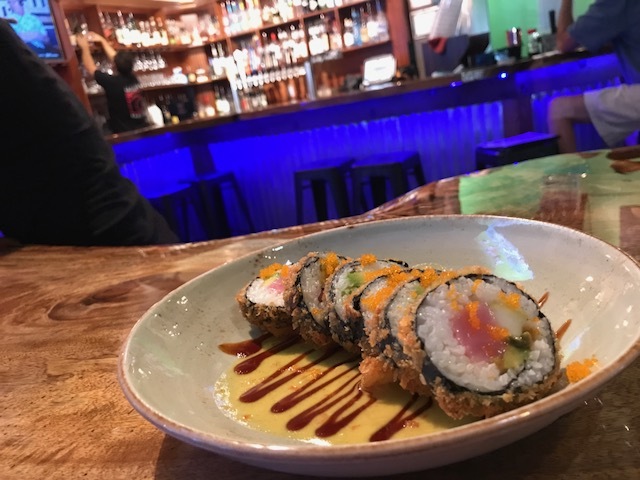 It’s a fresh sushi roll with local tuna, avocado and cucumber, panko-breaded and flash-fried, served over a Thai curry butter sauce and drizzled with unagi glaze. It’s crazy yummy!! The list of deliciousness goes on to include items like Sweet & Spicy Lettuce Wraps, Hurricane Fries, Coconut-crusted Shrimp, Fish Tacos and Three’s Wings. And what better place to enjoy those pūpūs than in our newly-renovated Surf Lounge?! Our bar was recently extended and the whole space was revamped with 15 additional seats and more T.V. screens to give you more room to enjoy your food and drinks. Some of Three’s favorite pūpūs and beer, displayed on the new mango wood table in our Surf Lounge. The MauiTime awards are voted on by our community. We’re honored to feel the love, because it tells us people are stoked on our food. By the way, it’s worth mentioning our sister eatery in Kīhei, Fork & Salad, just won Best New Restaurant, getting the news on its one-year birthday! At Three’s, we’ve worked really hard to create a very special happy hour, which won Best on Maui two years in a row, along with many runner-up mentions. It’s nice to know our pūpū menu gets that sort of recognition. Our staff deserves a huge shout-out. Every one of our employees, from our kitchen to front-of-the-house to bar staff, has helped build Three’s into what it is today. They all contribute in their own ways, whether sharing ideas for the day’s next special, getting delicious food to your table efficiently, or crafting hundreds of cocktails at the bar during happy hour, our team is straight-up amazing!! Thanks to them, and thanks to YOU, our loyal customers, for your continued support! “Three Cheers” to our New Bar Space! Cruise on in to our Surf Lounge at Three’s, and you’ll notice a big difference these days. We’ve transformed our charming little bar nook into a sizable drinking destination! In less than two months’ time, we’ve expanded the usable space in our lounge, replacing the old black granite counter top with sustainable Hawaiian mango and mimosa wood, adding 15 additional seats, building mahogany wood back bar shelving with LED lighting, and featuring crown molding finishes. We’ve even installed two more flat-screen T.V.s, and moved our big screen against the wall to accommodate more viewing. The new bar is absolutely stunning, and creates a beautiful focal point in our surf lounge that all patrons can enjoy. You can grab a drink while waiting for a table, or get comfy and chill a while to enjoy our award-winning happy hour, cheer on your favorites sports teams or check out the latest surf contest on T.V.! We’re proud to be recognized for our great happy hours, 3 to 6 p.m. and 9 to 10 p.m. daily, and aimed to incorporate a “trendy bar vibe” along with all our food and drink specials. We wanted our guests to sit at our bar and feel relaxed enough to drink and dine right there if they feel like it! So we designed it to be gorgeous, welcoming, functional and accommodating. The entire process took one-and-a-half months from inception to final installation. Chef Jaron led up the project management, which included design concepts, pulling required county permits, orchestrating trade teams (lighting, stainless steel, electrical work and additional carpentry needs), equipment selection and graphic art design. Chef Cody, who gives you the tour in our video, was the “master builder” of it all, from framing wood to fabricating sheet metal to epoxying bar tops. He crafted the bar off-site in three separate pieces, so it could be moved in on a moment’s notice, without disrupting business. This was no easy task, but as usual Cody and Jaron managed to pull it all off, using their math skills to fit the new pieces in place, and Three’s didn’t even have to close during the process! We couldn’t have done this without our amazing team’s support. Three’s front-of-the-house manager Lauren helped us design the operational functionality of the bar, as well as the artistic aesthetics of it. From color scheme to drink-making efficiency, her years as a Three’s bartender came in handy when making final calls or tough decisions. Tom, our go-to commercial carpenter, built the beautiful custom backbar shelving, and Wiki Wiki Electrical wired it all up! Join us at Three’s and see our remodel in person! Our old bar had only eight seats; this new space seats 23!! It was important for us to create a comfortable area for guests waiting for tables or just joining friends for a pau Hana. This space is made for YOU! The added seats are also a significant feature with our upcoming Diners, Drive-Ins and Dives episode set to air Friday July 21st (at 3 p.m. Hawai‘i time! ); we are anticipating a bump in business and want to accommodate all of our customers. Come have a seat in our surf lounge and check it out! Three’s wedding catering in action! Kalua Pork Quesadilla, an original on Three’s restaurant menu and at our very first catering event. Chef Travis and staff working their magic. The Three’s team plates food at an event. Ginger-crusted Mahi Mahi with Cucumber-Macadamia Nut Relish, which you’ll find at both Three’s Bar & Grill and catering events. Three’s Catering provides food for all Pacific Whale Foundation boats. Plated entrées at a catering event. Mediterranean Flatbread with Grecian salad, on both our catering and restaurant menus. Three’s Catering takes on events large and small. 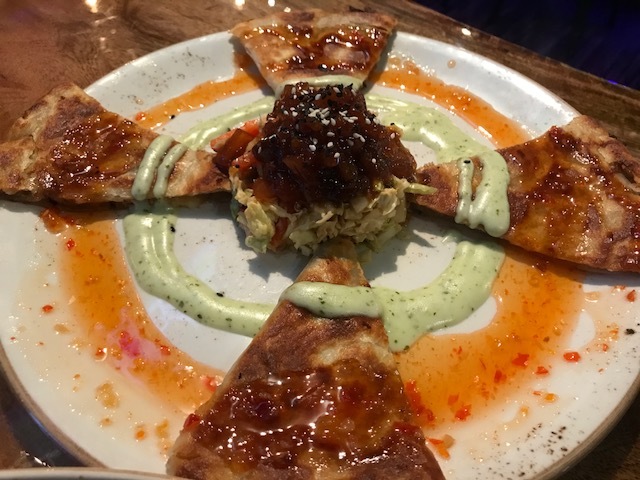 There is a part of Three’s that has existed as long as the Kalua Pork Quesadilla, Ginger-crusted Mahi and Mediterranean Flatbread have been on the menu. It’s so important, Three’s Bar & Grill may not be here today without it. The catering side of our business is what helped support Three’s while we were establishing our roots in Kīhei, and has grown to play a vital role in our identity today. So what’s it all about? Well, although catering is a ton of work, it’s a fantastic way to spread your brand, and gives people from all over the island a chance to sample your food. Three’s Catering is full-service, meaning we go beyond just providing your food. We offer service staff (servers, bartenders, captains), equipment rentals and even unique ways to stylize your event. We provide set menus and packages, or if you’d rather go custom, we have an in-house event planner to help organize it every step of the way. We cater pretty much everything you can imagine! Weddings (plated and buffet), food truck events, corporate events, action station events (sushi, noodle and hibachi grill stations) and all kinds of public events, from fundraisers to concerts to speeches. We also have extensive experience on boats, since we proudly cater all meal services for Pacific Whale Foundation. Some larger public events we’ve catered usually occur at the Maui Arts & Cultural Center (MACC). For instance, concerts are a big deal here on the island. Maui draws some big name talent, like Santana, Sublime, Elton John, Journey, and Jack Johnson to name a few, and that means large crowds to feed. Three’s has consistently been part of catering these large events, many of which draw upward of 5,000 concert attendees! We’re also stoked to cater a significant event happening Monday, June 26 at the MACC, when global media leader and philanthropist Oprah Winfrey will appear for a special conversation and Q&A session on health, wellness and happiness. The free special event, presented by HMSA and Sharecare, is called “Live Your Best Life,” and tickets are available through Sunday via a free online sweepstakes if you’d like to join in. Our sister restaurant Fork & Salad will also be catering a private VIP breakfast and lunch reception prior to the public event! Although you enjoy the finished product (the delicious food! ), planning for events, large or small, is a huge aspect of the business. For instance, weddings take months of precise back-and-forth coordination with our sales manager, including food choices, rentals, service staff, timelines, floor plans, diet restrictions and more. Everything is perfectly planned down to the exact amounts of chicken versus fish versus steak, to where each entrée is delivered per table, per seat. Larger public events like concerts demand a different style of planning, based upon estimated ticket sales and years of learning through experience. Our team is trained to execute interesting and delicious food quickly and efficiently, so you can get back to enjoying your show or event as soon as possible! Menus are geared to serve a particular clientele per event, and as with our restaurants, utilize as many Hawai’i farms and producers as possible; in fact, we source ingredients from more than 25 local suppliers! The top priority for our events remains customer service. We take pride in our ability to deliver exceptional service with a ton of aloha. Our goal is for every event to go flawlessly, with no worries for the client about any challenges, whether involving a contracted service from us or a different vendor like a florist, cake baker or deejay. If there’s an issue and we’re at your event, we work together to solve it, so the guests can focus on what matters: the celebration!! That’s what we’re proud of. Our menu at Three’s is designed to be diverse; to satisfy your appetite, whatever you’re in the mood for! But that also applies to kids, who get a special activity menu all to themselves! Taking keiki into consideration is an important part of any dining outing or experience, and we felt it was important to offer a great kids menu that not only pleases the parents, but gets the young ones craving Three’s too! With happy keiki munching away, parents get to take a breath and relax. Everyone can appreciate that. It’s nice to give children a choice when it comes to what they want to eat. From traditional kids items like chicken strips with fries and mac ‘n cheese to unique offerings like a BBQ kalua pork quesadilla, keiki caesar salad, and ramen, our menu aims to please. Other favorites include the keiki cheese burger made with Maui Cattle Company beef, pasta with parmesan, and our fresh berry bowl for some added vitamins and antioxidants! We also offer an array of beverages on the keiki menu, like POG (passion-orange-guava juice), milk (and the chocolate variety! ), soft drinks, tropical smoothies, and a fun, kid-friendly twist on a mojito, known as a tropical mock-jito! We take pride in being a restaurant that welcomes keiki with open arms. Our owners have kids and families too, and we want children to enjoy themselves just as much as the grown-ups do. As many parents know, it’s typically not the adults who decide on the restaurant, but the kids who make the choice!! So come on in and savor some quality family time plus great food in our surf lounge, dining room or outdoor patio with live music. See us anytime from 8:30 a.m. to 10 p.m. Monday through Friday, and our doors open at 8 a.m. on weekends for breakfast!